Hidden in the middle of Dartmoor, it takes a special trip to go to Gidleigh Park; but it’s well worth the effort. In 2009 I paid my first visit to Michael Caines’ 2-Michelin starred restaurant and was well impressed by the quality of the food and service, and decided that I simply had to return to this special place on my week-long gourmet holiday down in SW England. After the disappointing visit to Vineyard at Stockcross earlier in the week, I got a bit skeptical about another Relais & Chateaux place. After raving about Gidleigh Park, it would have been a disaster if the place didn’t live to my expectation, let alone the expectation of my American friends who came over to the UK specifically for the gourmet week. 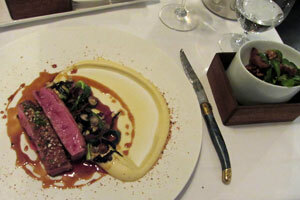 Also the brilliant dinner at Le Champignon Sauvage in Cheltenham the night before pushed that bar even higher. Although both tasting menus looked so tempting, we decided to opt for the a la carte menu, simply because there were some equally wonderful dishes there. 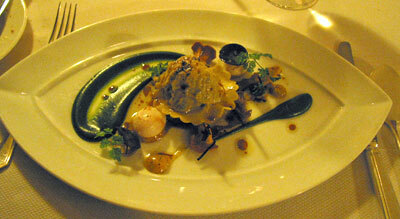 For starter, I opted for the Quail Raviolo – this was one large raviolo filled with quail meat, with truffled quail egg yolk on the side, and a herb puree precisely spreaded out onto the dish. The whole dish looked like a beautiful piece of artwork. Darcy opted for the Loch Duart Salmon, which was served with caviar, salmon jelly and cucumber, and drizzled with honey, soy and wasabi and Greek yoghurt vinaigrettes. 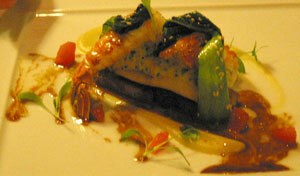 It was another dish that was beautifully presented, and the quality of the salmon just completely wowed her. Bob opted for the Red Mullet with Thai puree and fennel salad – I recommended this to him, based on the Brixham Scalliops with Thai puree that I had last year, which had a wonderful fragance that brought my memory all the way back to Thailand! 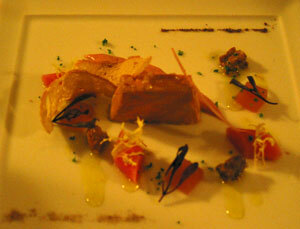 Russell had his usual choice of Terrine of Foie Gras with rhubarb compote, rhubard and lemon grass jelly, pickled rhubard and girolle mushrooms. 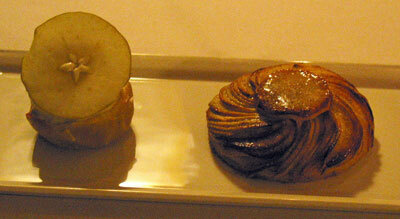 Both dishes were precisely executed. Everyone at the table had thoroughly enjoyed the first course. There was a sigh of relief for me. For the main course, Darcy once again went for the fish – this time it’s the Boudin of John Dory with Langoustine, served with apple and ginger puree, pink grapefruit, chicken and vanilla jus; while Russell went for the Saddle of Venison accompanied by braised belly of pork, chestnut puree, roast vegetables and raisons soaked in jasmine tea. Bob and I decided to go for the Cornish Duckling with star anise, orange braised chicory and orange scented sauce – so essentially a glamourous Canard a L’orange! For dessert, the choices included Selection of Cheeses, Passion Fruit Mousse (which came with rice pudding ice-cream and a coconut tuile), and the Hot Prune and Armagnac Souffle featured in the tasting menu. However, Bob decided to go for the Hot Apple Tarte which was served with vanilla ice-cream and Somerset cider coulis – being a tee-total, the coulis was omitted from the dish. 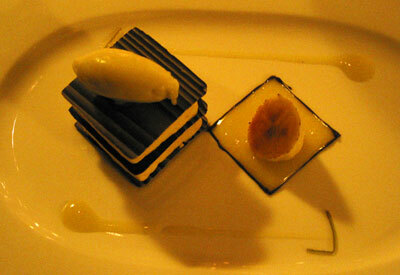 I opted for the Banana Parfait with chocolate and lime sorbet, which I had the year before. It didn’t disappoint. The winning dessert, must be Russell’s Trio of Chocolates: This consisted of hazelnut and milk chocolate parfait, dark chocolate mousse on a chocolate sable biscuit, and white chocolate ice-cream. 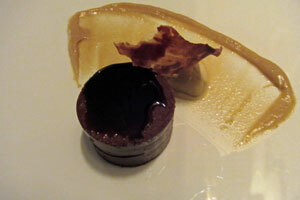 A real dream dessert for any chocoholics. The service throughout the evening was efficient and friendly, without over-imposing which can be the downside of so many of the Michelin restaurants. 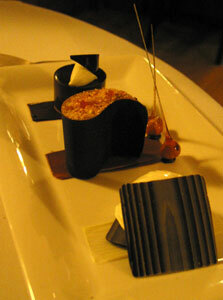 After dinner, we moved to the comfortable sitting room and sank into the sofa to enjoy the petit fours and coffee. What a pleasant way to finish off the evening – the hardest activity was to finally drag ourselves upstairs back to the room after such an unforgettable meal. If I really have to find one fault in Gidleigh Park this time, it would have been the aperitif. They were just a little bit too generous on the creme de cassis in the kir royale – making the drink a bit sweeter than usual. But then this is very much a personal taste, and if I make a fuss about this, I’d risk myself turning into a grumpy old man! The meal may not have all the fancy tricks that Heston Blumenthal would have at the Fat Duck, but it’s genuinely well executed and after scoring a nearly perfect 19/20 last year, I am ready to give Gidleigh Park this time to a perfect 20/20. Torquay is one of those places that I have heard of for many years but never managed to visit. 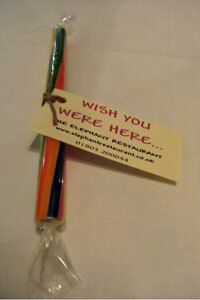 For the past few years, I have also wanted to visit The Elephant Restaurant every time I visited Devon and Cornwall in March, but as the restaurant is always closed in the winter season, I have not managed to do so until this year, when my annual visit down to this part of the country has been postponed to the latter half of April. 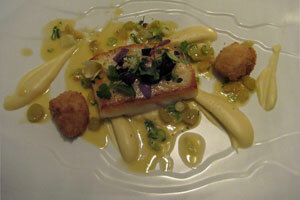 I have heard a lot of good things about the head chef and owner Simon Hulstone also. So I made a detour to Torquay on the way down to Cornwall and paid a long-awaited visit to The Elephant. The Elephant is divided into two sections: The ground floor is the brasserie while the first floor is “The Room” (the one Michelin-starred restaurant). This seems like a good business move. It was one of those really nice warm April evenings that I visited The Elephant. The restaurant was light and airy, with signed menus of various chefs across Europe adorning the walls, and the windows providing beautiful views of the Torquay harbour and marina. It was a shame that the music was on the slightly loud side (but maybe I am getting too old!). 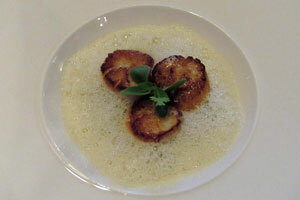 For the starter, Russell opted for the Bay Scallops (Dived scallops with cabbage, lemon confit, risotto) – it was cooked well, more on one side, and risotto not heavy at all. 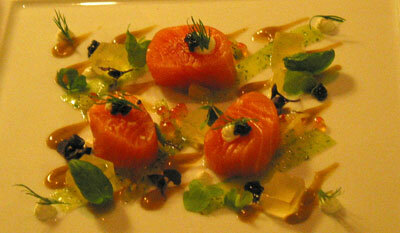 Th dish was nicely accented by the flavour of the lemon confit. If there’s one criticism of the dish, maybe there was slightly too much foam and hiding what’s underneath – a presentation issue that’s easily fixable. 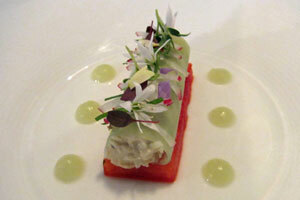 For me, I had the Devon Crab (Brown and white, cucumber, watermelon, fritter, ketchup, lovage) – The white crabmeat with the watermelon was very light and refreshing, and contrasted well with the heavier and more flavoursome brown crabmeat fritters which were on a layer of crab tartare. Russell’s main course was Duck (Roasted breast, celeriac puree, pak choi, spiced honey, pain d’epices) while I chose the Halibut (Parsnip, lardo, verjus, spring onions, golden sultanas, flower). Duck and quince worked well together: the roasted breast was soft and tender with a magnificent crispy skin topping, and the poached quince in spices complimented really well with the duck. My halibut was nicely-cooked also – it was a nice combination with all the ingredients but not outstanding compared to the duck. I have been trying to avoid chocolate-based desserts and especially anything with salted caramel for a few months as I had a few less-than-pleasant experience (inferior chocolates and ultra-salty caramel) in the past. However, having checked the types of chocolates used at The Elephant, I decided to take a risk and tried the Chocolate (Chilled fondant, feuilletine, salted caramel, banana) – I was so glad that I tried this, as the mixture of chocolates worked well together, and the banana puree decorated the side of the plate formed an integral part of the dish both in terms of taste and presentation. The salted caramel was not too salty either and I liked it very much. Russell opted for the Treacle Tart with marmalade, milk, clotted cream: The treacle tart was light, and the orange marmalade was bitter but went very well with the tart. Service was warm and friendly enough, but for some reasons the waitresses seemed a bit nervous? 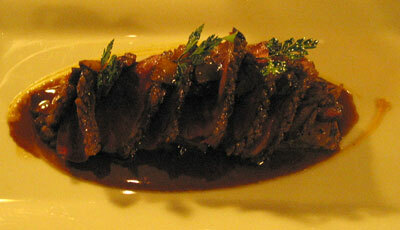 I was glad to have visited the restaurant and finally tried Simon’s cooking. I even loved the sense of humour when we got the seaside rock with the bill, with the tag saying “Wish you were here” – I could certainly think of a few people that I’d give the rock to.